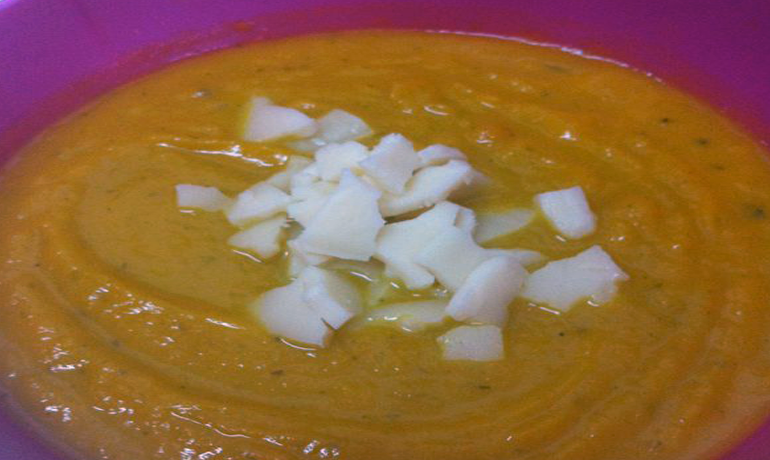 Orange soup is one of the most popular soups in the Israeli winter. (Together with onion soup of course). Here is a recipe for orange soup that will warm you not only winter but you will reap praise from all who tasted it! 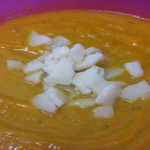 This orange soup usually is made with the help of a blender. If you do not have one - Prepare as usual until the stage of the blender – then turn off the heat, wait for the soup to cool - and grind everything in a food processor - and then return to the pot until the end of the cooking. Sour cream - at least 32%! Peel the sweet potatoes and cut into cubes. Peel the carrots and cut into circles. Peel the onion and cut into thin strips lengthwise. Cut the celery in half. Heat oil in a large saucepan. When the oil is hot - Put the onion and fry until it becomes clear. Add the sweet potatoes, pumpkin, carrots and celery. Fry for 4-5 minutes while stirring. Add water until all the vegetables are covered. When everything is boiling and bubbling, add the spices, parsley and dill and stir. Lower to a medium – low heat and simmer for 40 minutes - until the sweet potato and carrots are tender. When the vegetables have all softened – take a blender and blend until smooth texture. Cook a few more minutes on low heat - stirring continuously. Now go ahead and enjoy your soup…..don’t forget to dress warm! Serve with grated cheese or a tablespoon of cream in the center of the bowl.